We put a lot of interesting articles about fashion and culture on our Facebook Fan Page and once in a while we get some pretty good comments. 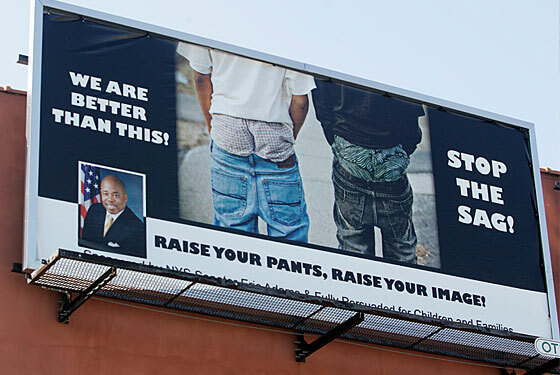 Earlier this week, we posted a blog post from NYMag.com’s The Cut about an anti-sagging pants billboard that is part of a whole “don’t show your underwear” campaign that New York State Senator Eric Adams recently launched. Hip hop mogul Russell Simmons said that the campaign was a “waste of time” which, of course, started this whole debate about the never ending trend of sagging your jeans below the waistline to show your boxers and your loyalty to the urban culture. On our Facebook page, advertising major, Jesse Oberst put in his two cents about the whole ordeal in not one – not two – but THREE comments. That’s why we thought we should share his rant…. Jay-Z has a track (“Off That”) on his album Blueprint 3 that’s relevant to this topic. He basically condemns oversized clothing, nice rims, and violence. He’s doing his part to evolve the hip hop community. This is the kind of effort that will have a significant impact, not some disconnected message on a billboard. (I’m an advertising major, if that makes a difference). Artists like Andre are using music to send a message that will impact an entire culture. That is where the true value of change is. Mainstream media just won’t cut it, advertising industry needs to get with it. …and finally (LOL) it’s interesting to note that Russell Simmon’s current menswear collection is about as boring and preppy as the Senator that endorsed that billboard; consisting of polos, khakis, and argyle sweaters. I am impressed however by the overall fitted look of like-minded labels like Rocawear and Sean John. They’re ad campaigns are a good influence on their target audience. Do you think that this anti-sagging pants campaign is worthless? Read the blog post from The Cut and tell us your thoughts.